The ideology of neoliberalism: trickle down theory of growth and distribution. The reality a tad different: the gushing up of income and wealth. But, in a manner of speaking, we always knew that this is what neoliberalism was all about; we knew, in other words, that the neoliberal turn of the late 1970s was meant to facilitate the flow of income, wealth and power up the societal pyramid, that it was meant to restore the economic and political clout that “finance capital” had lost during the post World War II period. We knew that it was meant to efficiently pump the economic surplus out of the working people and channel it up the income ladder to the top fraction of the capitalist class. That neoliberalism performed this role even more effectively than expected by its hardest-core champions emerges clearly from recent studies of income and wealth trends of the past few decades. Noted Marxist economists Gerard Dumenil and Dominique Levy have studied the changing patterns of income and wealth under neoliberalism in great detail . Drawing on the extensive research on income and wealth inequality around the world by Emmanuel Saez  and Thomas Piketty , Dumenil and Levy clearly show: (a) that the neoliberal regime was preceded by falling income shares of the top income groups in the US for an extended period of time, (b) that the so-called neoliberal turn has clearly reversed the trend towards progressive redistribution of income of the post-War years, (c) that the income shares of the top income groups have climbed back up to pre-War levels, and even surpassed them, and (d) that ownership of the productive resources of society remains as skewed as before making claims of the development of middle-class capitalism in the U.S. totally baseless. Below, we reproduce some of the striking trends that Dumenil and Levy’s presented in their article in the New Left Review (Volume 30, November-December, 2004) and also extend the analysis to the year 2007 (by using an extended data set that Saez and Piketty has made publicly available). The picture that emerges from such an analysis clearly show that the trends identified by Dumenil and Levy (2004) have continued operating unhindered right until the end of 2007, i.e., right till the onset of the Great Contraction of 2008. Did the current crisis have anything to do with this worsening distribution of income in society? Will the Great Contraction turn into the Great Depression of the 21st century? Will the current crisis unleash progressive social forces that will reverse the horrific neoliberal income trends? Will the working class regain its social and political strength? These are important and interesting questions, but I do not wish to address them in this article. Let us instead study the evolution of income distribution in some detail. 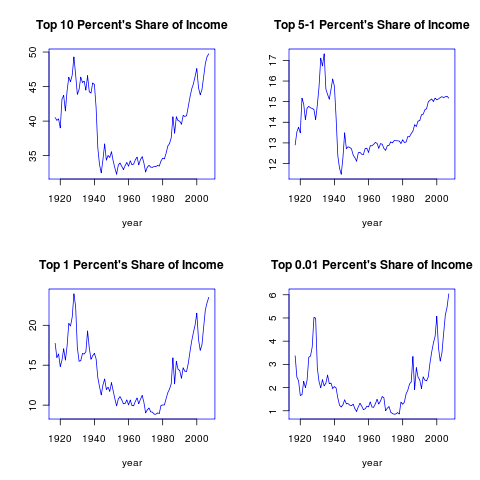 Chart 1 presents data relating to the shares of total income going to various “top” income earning groups in the U.S. for the period 1917-2007. Even a cursory glance reveals the most striking feature shared by all the graphs, their U-like shapes. The U-shape implies the following: the share of total income garnered by the “top” group was historically high in the 1930s (the pinnacle of the original liberal era of capitalism); the share steadily declined after the second World War, through the “Golden Age of Capitalism” (because of the struggle of the working class); the trend reversed course around the late 1970s (with the onset of the neoliberal counter-revolution), and steadily gained lost ground in the next three decades. This general feature is true of all the graphs and is the remarkable feature about income distribution that emerges from all serious studies. The first graph on the left-top of Chart 1 displays the share of income going to the top 10 per cent of income earners in the U.S. Towards the end of the 1920s, the share of the top 10 percent had nudged 50 per cent (from below); it recovered that level by 2006. The top 10 per cent of the population takes half of all the income created during any year; isn’t that remarkable? Well, that is (neo) liberal capitalism. The second graph of Chart 1, the one on the right-top, displays the share of income going to the group of income earners running from the top 5 to the top 1 per cent of the population. Much like the top 10 percent, their income fell through the Golden Age and then started the ascent in the neoliberal era, without as yet reaching the historically high levels in the late 1920s. The third graph at the bottom-left of Chart 1 displays the share of income going to the top 1 percent of the U.S. population. Quite astonishingly, they get more than a fifth of all the income generated in society now: just a nice throwback to the glorious late-1920s, they would point out. Thus, in 1928, the top 1 per cent of the income earners in the U.S. got about 24 per cent of the total income; in 2006, the top 1 per cent of the population was once again receiving about the same share: 24 per cent of the total income generated in the economy. What about the scenario at the very top, the top of the top so to say? The fourth graph in Chart 1, the one at the bottom-right, provides some clues. As can be seen, the share of income garnered by the top 0.01 per cent of the income earners was about 5 per cent of the total income during the 1920s; that figure had already been reached by the end of the 1990s. The dip in the share at the end of the 2000 is a reflection of the bursting of the dot-com bubble and the ensuing short recession in the early parts of 2001. 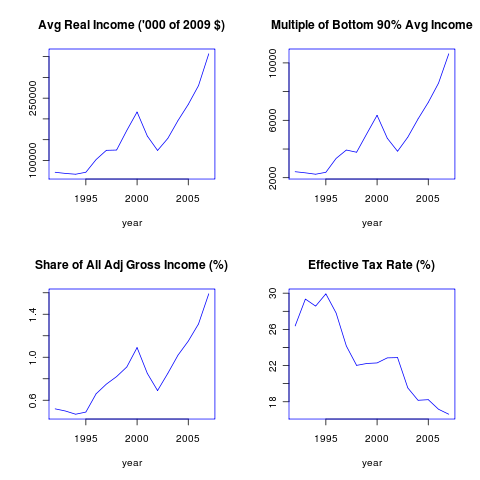 They got their act together pretty quickly, and the share of total income going to this group rapidly climbed up in the “boom” of the 2000s, surpassing the figure for the heyday of liberal capitalism. In 1928, the top 0.01 per cent of the income earners in the U.S. garnered about 5 per cent of the total income; by 2006 their share of total income was back at that level: 6.04 per cent. Neoliberalism triumphs liberalism! What do we take away from these striking graphs? I would suggest the following three. First, we can safely make the claim that income and wealth are awfully concentrated in capitalism; a capitalism that caters to the middle class is a myth. To understand the import of this simple proposition recall that the mainstream media never tires of portraying the U.S. economy as a haven for the middle class, where anyone, even Joe the Plumber, can easily climb up the economic ladder with grit, determination and hard work; or, so the story goes. Aggregate trends in the distribution of income over the last three decades that have been presented in Chart 1 clearly makes nonsense of this oft-repeated fairy tale. Second, the concentration of wealth and income under capitalism is nothing new; it is rather the normal state of affairs in capitalism, as the data for the last 90 years show. When one takes a long and historical view, the so-called Golden Age of capitalism, based on the compromise between capital and labour, and buttressed by re-distributive policies of a welfare state, seems to be the exception rather than the rule. The workings of welfare state capitalism quickly led to the creation of a situation, endogenous it must be remembered, that militated against the core principles and institutional features of welfare state capitalism. And third, that the concentration of income, wealth and power keeps increasing as we move up the income pyramid, so that the buck really stops at the top. What about the very top of the top of the top? Well, let us see. Here are some facts to get started with. Average annual income of the top 400 income-earning families was $131.1 million in 2001; it had more than doubled within the next 6 years, reaching $345 million in 2007. That was a whopping 17.5 per cent annual compound rate of growth over that 6 year period. In 2007, the total income of the top 400 families was $138 billion, rising from $105.3 billion a year ago. Adjusted for inflation, the top 400 families witnessed a 27 per cent increase in their income between 2006 and 2007; the bottom 90 per cent of U.S. families saw their income rise by a mere 3 per cent during the same period. If we go back a little further we see the divergence taking shape more clearly. Between 1992 and 2007, the real income of the bottom 90 per cent of the U.S. families increased by 13 per cent; during the same period, the real incomes of the top 400 increased by 399 per cent. To make the comparison a little more systematic and to get an idea of the true nature of the income generation process under neoliberalism, we have summarized some data in Chart 2. The graph on the top-left in Chart 2 plots the inflation adjusted average income of the top 400 U.S. income-earning families from 1992 to 2007. Average real income increased from $71.6 million in 1992 to $356.7 million in 2007, a 399 per cent increase over the 15 year period, which translates into a real income increase of $285.2 million. The graph on the top-right of Chart 2 plots the ratio of the average income of the top 400 families and the average income of the bottom 90 percent of U.S. families (arranged in terms of household income). In 1992, the ratio was 2419; in 2007, it had become 10634. Think about these numbers again. In 1992, the average income of the top 400 U.S. families was 2419 times the average income of the bottom 90 per cent; in the next 15 years, that ratio had seen a more than 4 fold increase. That is neoliberalism in a nutshell. The last graph, the one on the bottom-right of Chart 2, shows the policy response of the U.S. governments to this rising inequality. What should the state do when faced with this enormous concentration of wealth at the very top of the income pyramid? Why, aid that process. Effective tax rates for the top 400 families saw a remarkable secular decline over this 15 year period, starting at 26 per cent in 1992 and falling to about 17 per cent by 2007. So, as the incomes started flowing up, tax rates started going down. Result: disposable real income, i.e., after-tax real income, of the top 400 U.S. families shot through the roof. How did this huge income inequality get built up? The simple answer: neoliberal counter-revolution. The whole institutional set-up and policy framework that characterized the so-called Golden Age of capitalism was the result of the class struggle of labour against capital; the power of the working class had managed to institute policies that resulted in the re-distribution of income away from capital and towards labour. The neoliberal counter-revolution reversed this historical trend and got the re-distribution to start working the other way round: move income away from labour and towards property owners and the top wage-earners (managers, technocrats, CEOs, etc.). Probably nothing demonstrates this better than the evolution of wage income, i.e., the income of the working people in the U.S. over the last few decades. Let us take a look. Chart 3 presents some relevant data on wage income. The first graph in Chart 3, the top-left graph, plots the time series of the average annual real wage in the US economy for the period 1970 to 2005. Average annual real wage is computed from the National Income and Product Account data as the ratio of total wages and salaries and the number of full-time employees; to take account of inflation over the years, the wage has been expressed in 2006 prices. The average annual wage, as shown in the graph, increased from about $38,000 (2006 $) to $47,670 (2006 $). So, did workers really increase their average incomes during the last three decades? The answer is no. The second graph in Chart 3, the top-right graph, plots the time series of weekly real wages of production and non-supervisory workers in the nonfarm business sector of the US economy for the period 1964 to 2009. This data – relating to the production workers in mining, logging and manufacturing, construction workers in construction and non-supervisory workers in the service sector – is taken from the website of the U.S. Bureau of Labour Statistics and is expressed in 1982 prices to remove the effect of price increases (i.e., has been deflated by the consumer price index for all urban consumers with a base year of 1982). Here, we see a remarkable trend, a trend that really explains the secret of neoliberalism: real weekly wages of production and non-supervisory workers fell between 1964 and 2009. True, there was a slight recovery starting from the mid-1990s, but that has not managed to take the real wage back to the level of 1964, let alone the higher level of the early 1970s. Real weekly wages in 1964 was about $314 (1982 $); in 2009, it was about $287 (1982 $). Moreover it is clear that the recovery that had started in the mid-1990s will be pretty difficult to sustain in the midst of the deepest recession since the Great Depression. Thus, the upward movement of average annual real wages that is depicted in the first graph of Chart 3 is really driven by increases of the “wages and salaries” of non-production and supervisory “workers”, the fraction of the working or middle class that derives its income as a deduction from the surplus value generated by production workers. This would imply a growing inequality even among the ranks of the wage earners. And that is precisely what is depicted in the third and fourth graph in Chart 3, the bottom-left and bottom-right graphs. Let us look at them one at a time. 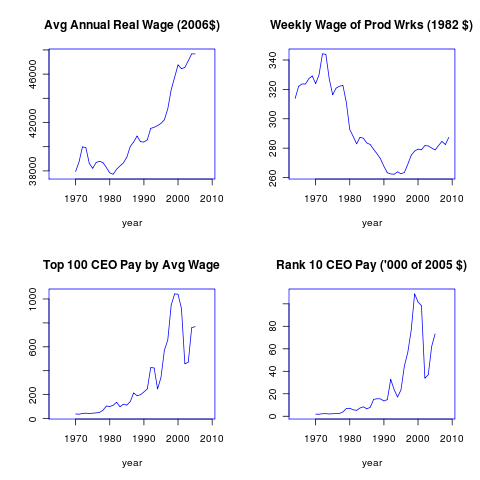 The bottom-left graph plots the ratio of two quantities: (a) the average annual real pay of the top 100 CEOs in the Forbes survey of the top 800 CEOs (in terms of pay), and (b) the average annual real wage in the U.S. economy (the data that has been plotted in the top-left graph in Chart 3). In 1970, the ratio was about 39; in 2005, it was about 768, coming by way of 1043 in 1999. Thus, in 1970, the average income of the top 100 CEOs was only about 39 times the average annual wage in the economy; in 1999, the average annual income of the top 100 CEOs had become 1043 times the average annual wage in the economy! The bottom-right graph plots the average real pay of the rank 10 CEO (in 2006$), i.e., the pay of the 10th CEO from the top when all CEOs are ranked according to their incomes. The real pay of the rank 10 CEO in 1970 was about $1.87 million (2006$); in 2005, the corresponding figure was $73.24 million (2006$), having climbed down from an astronomical $109 million (2006$) in 1999. That is more than a 50 fold increase in 19 years! Thus, neoliberalism not only increased the share of property income (in aggregate national income) but also increased the share of income that accrues to the hangers-on of capitalism, the managers, the supervisors, the technocrats, the bureaucrats, in short the class of people who oversee and facilitate the extraction of surplus value from the working class, and contribute to the reproduction of capitalist relations of production. How did this impact on the working class and the macro economy? Since real wages were stagnant or even falling, the working class that had become used to increasing consumption levels over previous decades had to be fed with an ever exploding mountain of debt. First the dot-com bubble and then the housing bubble partly facilitated this process. The growing debt kept consumption levels of the working class growing even, but only at the cost of increasing the financial fragility of the macro economy. When the housing bubble burst towards the end of 2006, that started off the financial crisis. Dumenil, G. and D. Levy. 2004. Capital Resurgent: Roots of the Neoliberal Revolution. Harvard University Press. This data is from Saez and Piketty. Average annual wages are in 2006$ and average CEO pay is in 2006$; hence, the exact ratios might a little off the mark though the trend will certainly be fairly accurate.